It began by receiving a Valentines Day card in the mail. Now I carry around my own head in my pocket. Thanks Draconess! Overall, I thought the Night of Murder event was pretty well done. It was not nearly as grindy as Kegs End. It was almost a little too easy, almost. On the first day, after an hour or two I already had the advanced reward (Murder Fang trophy). This was not even going out of my way to do anything, just time spent in Open RvR. That being said, I will not be completing the event. So really, it wasn't that easy. The 10 Keep Lords and the 20 Marked NPC's will remain unchecked in the Tome. I did get the Elite reward, but won't get the final title. Marked Targets. There were a ton of marked targets in RvR. So many that I never really felt the need to target them specifically. It would have been neat if killing them gained your group a short term buff or just make them a bit more rare. Atmosphere. I would have loved to see some more stuff going on in the warcamps/cit that had to do with the event. Maybe some folks getting chased by DoK's or decorations. Shrines. 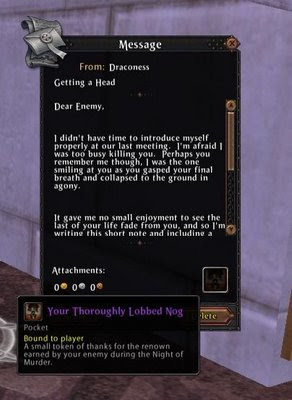 The Shrine of Khaine was extremely easy to kill. There was rarely any battles over them that I saw. Maybe move the buff from here to the Marked targets? Shrines would be an interesting place to get event loot too. Now that this event is wrapping up, we are only a few weeks away from the next one... Bitter Rivals! I'm the opposite on the marked targets. I barely saw any when I was out in RvR, except on the very first day. It would be better if the mark was purely random, instead of based on whether or not the player has accepted the "Marked for Death" quest. There were Marked target spawn points throughout the main cities. They spawned at a slow rate sadly, but at least they were available to those not wanting to fully grind in the RvR Lakes.